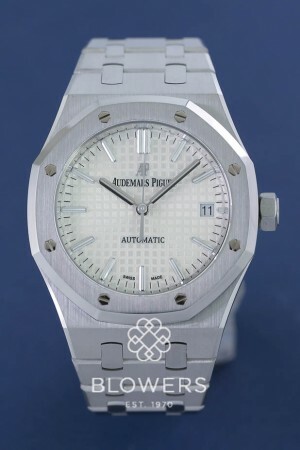 Audemars Piguet Royal Oak Selfwinding 15450ST.OO.1256ST.01. Stainless steel case with bezel diameter of 37mm. Water resistant to 50 meters.Power reserve of 60hours, Self-winding watch with date display and centre seconds. Silvered Grande Tapisseri pattern dial, white gold applied hour-markers with Royal Oak hands and luminescent coating. Stainless steel bracelet with AP folding clasp. SKU: 3026322. Categories: Audemars Piguet, Royal Oak.